Here at Andros we are dedicated to manufacturing high quality robust tools and equipment. We offer irrigation equipment, consulting, training, and service with over 30 years’ experience in Agriculture, SX Mining and Crop Protection. 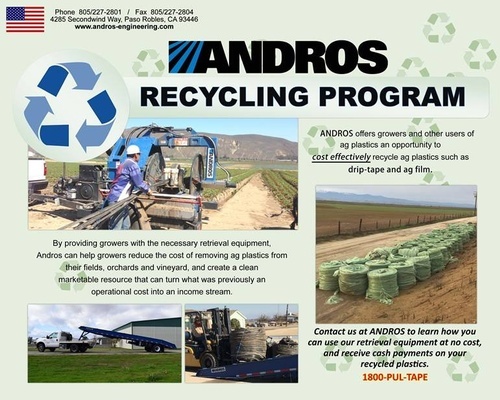 Research and development are two essential elements in the Andros strategy. With projects in precision viticulture, field processing automation and precision vegetable production, we continue investing in research and development for practical yet innovative solutions. Our goal at Andros is to find the answers that will contribute to your success.